Purpose : To define the main causes of blindness, demographic characteristics and barriers to care of blind patients attending a teaching eye hospital in Iraq. Material and Method : Successive new patients, 6 years of age and older, who attended three outpatients clinics at Ibn Al-Haetham Teaching Eye Hospital (IAHTEH), Baghdad, Iraq, from September 1 to November 30, 2007, were included in this study. Inclusion criterion was fulfillment of the World Health Organization's definition of blindness. The cause of blindness was identified and subjects were interviewed for collection of data on demographic characteristics and barriers to treatment. Results : Of 18612 consecutive patients who attended the outpatient clinics, 497 (2.7%) patients were blind. Cataract (76.1%), diabetic retinopathy (12.9%), and glaucoma (5%) were the leading causes of blindness. The majority of blind patients had low socioeconomic status and poor educational level. In cases of cataract, the most important barrier to treatment was the waiting list at the hospital (53.7%). A lack of awareness was the most important barrier to treatment for patients with diabetic retinopathy (54.7%) and glaucoma (56%). Conclusions : The preliminary data from our study will aid in the development of blindness prevention programs in Iraq. Priorities include decreasing waiting lists for cataract surgeries at governmental hospitals. Active health promotion programs for early detection and treatment of diabetic retinopathy and glaucoma are also warranted. Iraq (Mesopotamia of ancient history) is a Middle Eastern country with a population of approximately 27 million. The last three decades of war and strife have had a significant negative impact on medical services, health promotion programs, medical surveys, and medical research. There is no recent nationwide survey on the prevalence and causes of blindness in Iraq. With the ongoing unstable geopolitical situation in Iraq, there seems little hope of conducting nationwide population-based studies of blindness in the near future. The absence of reliable data on blindness in Iraq prevents the development of national eye health programs or achieving the goals of the Vision 2020 initiative. However, data on blindness obtained from hospitals provide some information to national health agencies. This study evaluated the main causes of blindness among patients attending Ibn Al-Haetham Teaching Eye Hospital (IAHTEH) in Baghdad, Iraq, to assess the barriers to early treatment and to provide preliminary data for blindness prevention programs in Iraq. Ethical board approval was granted by the Scientific Committee of IAHTEH. This descriptive hospital-based study was conducted at IAHTEH which is the central teaching eye hospital in the country. IAHTEH is a government hospital that provides medical services largely free of charge and is a secondary and tertiary referral center that accepts patients from all parts of the country. On average, 600 individuals, equally distributed among five outpatient clinics, attend the hospital daily. In this prospective case series, the author randomly chose three out of the five outpatient clinics to conduct this study. Successive new subjects, 6 years of age and older, attending these clinics over the 3-month period from September 1 to November 30, 2007, were enrolled for the study. Subjects were enrolled in the study if they fulfilled the definition of blindness accepted by the World Health Organization (WHO): i.e., best corrected visual acuity (BCVA) of less than counting fingers at 3 meters' or 'visual field no greater than 10° around central fixation in the better eye.' General ophthalmologists and specialists and who were on call at the outpatient clinics were requested to recruit consecutive new subjects presenting with blindness, including those with uncorrected refractive errors. Presenting visual acuity and BCVA were measured by optometrists using standard Snellen charts at 6 meters. Subjects unable to read the top line of the chart were tested at 3 meters, and those with poorer vision were tested sequentially by finger counting, hand movement, and light perception. All subjects underwent an ophthalmic examination after history was taken. Eye examination included slit lamp examination of the anterior segment (Topcon Corp., Tokyo, Japan). The fundus was examined by indirect ophthalmoscopy (Keeler Instruments, Philadelphia, PA, USA) with a +20 diopter lens after pupillary dilatation. Intraocular pressure was measured with an applanation tonometer (Haag-Streit AG, Koeniz, Switzerland) if clinically warranted. Goldman perimetry was performed on subjects who required visual field assessment. Subjects were initially examined by general ophthalmologists and then presented to specialized ophthalmologists for approval of final diagnosis and consideration of treatment alternatives. In order to standardize patient recruitment, all participating ophthalmologists were informed of the WHO definition of blindness and were required to adhere to this definition. Subjects with curable blindness were provided with appropriate treatment. Group A: Those with stable employment and not financially dependent on others. Group B: Those without employment and not financially dependent on others. Group C: Those without stable employment and financially dependent on others. The enumerators collected and recorded all data in special forms. After collation of data, the names of the subjects were checked and subjects who attended the outpatient clinics more than once were included at the first visit only. Descriptive data analysis was performed with calculation of means and ranges and the 95% confidence interval (CI) of numerical variables. The number and percent of subject responses to various questions were collated and are presented here. Out of 18612 consecutive subjects attending the outpatient clinics 497 subjects [2.7%; 95% confidence interval (CI): 2.44 to 2.90] were blind, [Table 1]. The mean age of patients was 61.8 years (range: 6-80 years), with a male to female ratio of 1:1.3. Cataract, the leading cause of blindness, was present in 378 (76.1%) subjects, whose mean age was 68.5 years; the male to female ratio in cataract patients was 1:1.4. 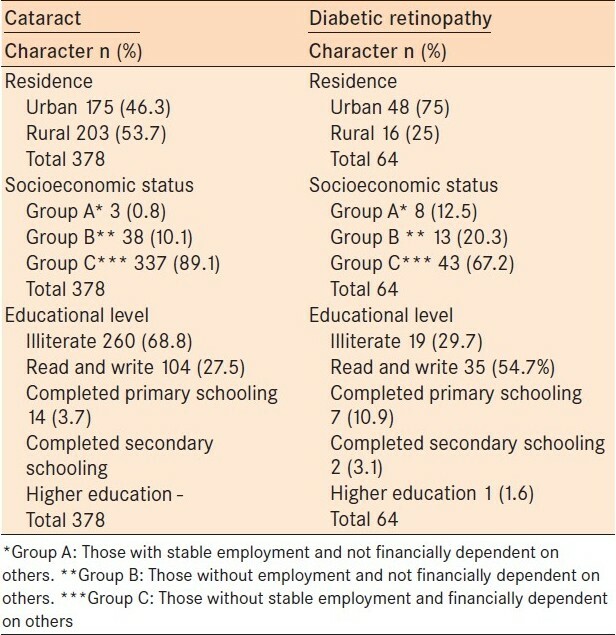 Most blind subjects with cataract were illiterate and unemployed [Table 2]. They could maintain a simple quality of life with relatively poor vision and they or their families were unwilling to present for surgery until vision had been severely impaired. Once booked for surgery, these subjects were faced with long waiting lists at the hospital and repeated postponement of surgery [Table 3]. Advanced diabetic retinopathy (tractional retinal detachment or severe vitreous hemorrhage) was the cause of blindness in 64 (12.9%) subjects. The mean age of the subjects who were blind from diabetic retinopathy was 51.7 years, with a male to female ratio of 1:1.3. Most of these subjects were of low socioeconomic status and had little education [Table 2]. 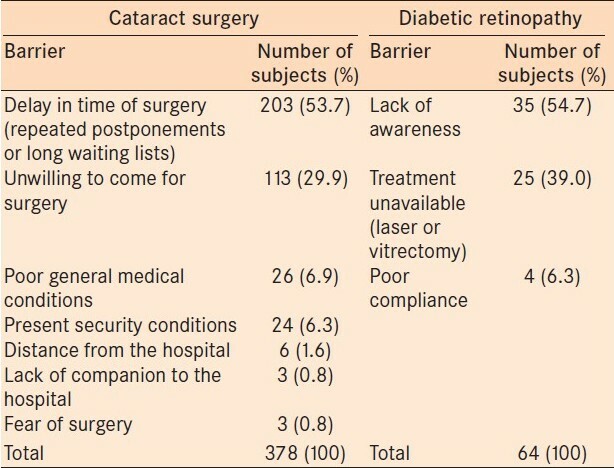 The most significant barriers to accessing treatment were lack of awareness about diabetic eye complications for 35 (54.7%) subjects and a lack of availability of treatment (laser or vitrectomy) for 25 (39.0%) subjects [Table 3]. Primary open-angle glaucoma was the cause of blindness in 25 (5%) subjects, most of whom were unemployed and had little education. Barriers to accessing treatment for this group of subjects included a lack of awareness of glaucoma in 14 (56%) subjects, poor compliance in 9 (36%) subjects, and high cost of medications in 2 (8%) subjects. Corneal scars secondary to keratitis caused blindness in 8 (1.6%) subjects. Seven of these subjects had clinical manifestations of cicatricial trachoma (bilateral dry eye, conjunctival scarring, trichiasis, and corneal opacities); these patients were elderly and illiterate. One subject (a 19-year-old female) had bilateral corneal scars secondary to simultaneous bilateral keratitis caused by wearing of cosmetic contact lenses. Blast injuries were the cause of blindness in 6 (1.2%) subjects; these patients were in the age range of 8-35 years. The limitations of hospital-based surveys are well-recognized. These studies do not represent the real prevalence of blindness in the population as the subject pool is self-selecting, since those who cannot attend hospitals and those who are unaware of their disability are not included. This study, although hospital-based, has a number of strengths. It was conducted at a central specialized eye hospital and included only those with bilateral blindness. This probably makes the data from the current study reflect the causes of blindness of the community at large because the majority of people seek treatment when their vision becomes severely impaired, especially when medical services are freely available at a well-recognized center in the country. In addition, this study illustrates the demographic characteristics of the blind patients and the barriers to treatment. The leading causes of blindness among subjects presenting to IAHTEH were cataract, diabetic retinopathy, glaucoma, corneal scars, and trauma. Diabetic retinopathy was a major cause of blindness in our study. In Iraq, the prevalence of hyperglycemia ranges up to 10.4%. Many patients suffering from diabetic retinopathy do not seek treatment until their vision is impaired due to advanced disease and fails to respond well to treatment. Accessibility to specialists remains a problem as there is only one center for vitreous surgery in the entire country, and even this is poorly equipped. Although lasers are available in some hospitals, there is a shortage of vitreoretinal surgeons and specialists in medical retina. Our data indicates that lack of awareness regarding glaucoma and poor compliance with medications are the most important barriers to treatment for subjects who are blind due to glaucoma. Many subjects reported that they discontinued using topical medication because they had no noticeable improvement in vision. Additionally, many new topical medications are unavailable in governmental hospitals and are quite expensive when bought from private pharmacies. Compliance with treatment and awareness of glaucoma can be increased by educating primary health care providers at dispensaries regarding the insidious nature of glaucomatous damage and the familial occurrence of this disease. Targeted education to individuals diagnosed with glaucoma regarding the importance of continual medical therapy and periodic ophthalmic visits are warranted. As resources become available in the future, implementation of vision rehabilitation programs for the visually challenged is highly recommended. Corneal scars were an important cause of blindness in this study. As IAHTEH is a referral center, active trachoma is rarely seen here; however, the sequelae of cicatricial trachoma are commonly seen in elderly subjects, especially those from rural areas. A community-based survey is required to determine if trachoma remains a public health problem. Keratitis due to cosmetic contact lens wear is a significant and growing problem in Iraq, with most patients obtaining their lenses from non-professional sources, without ocular assessment or training in proper lens hygiene and care. Donor corneas are not available in Iraq, and there is a long waiting list of patients who require corneal grafts. Although Iraq is included among the regions suffering from severe vitamin A deficiency,  we found no cases of xerophthalmia. Trauma is an important cause of blindness due to the security conditions in the country. The absence of a national blindness prevention program in Iraq may result in misallocation of resources and the ineffective utilization of available medical eye services. While waiting for a nation-wide survey of blindness, healthcare professionals can design specific strategies according to the available data in order to decrease the burden of blindness in the community. Priorities in these strategies include reducing the barriers to accessing treatment for the leading avoidable diseases, carrying out effective health education programs directed toward the target patients, and providing affordable and sustainable medical services. Screening programs are warranted for the detection of retinopathy among diabetic patients attending general hospitals and dispensaries and for the detection of glaucoma among people above 40 years of age, especially those with a family history of glaucoma. Public health education programs are essential to raise awareness about the risks and consequences of diabetic retinopathy and glaucoma and the benefit of early detection and treatment. Public health education should also emphasize the proper care and use of cosmetic contact lenses and the sequelae associated with misuse. The expanding burden of blindness must be initially controlled by improving the capabilities of governmental hospitals for carrying out cataract and other ocular surgery through provision of well-equipped specialized operation theaters. Active recruitment of new graduates in ophthalmology to practice in government hospitals is required. Additionally comprehensive training on the use of new ophthalmic technologies and techniques is required. Continuing medical education (CME) for ophthalmologists, nurses, and allied healthcare workers in ophthalmology is indispensable for improving their role in the prevention of avoidable blindness. The leading causes of blindness according to this hospital-based study are cataract, diabetic retinopathy, and glaucoma. Priorities in blindness prevention programs in Iraq are measures to decrease waiting lists for cataract surgeries at governmental hospitals and activate health promotion programs for early detection and treatment of diabetic retinopathy and glaucoma. 1. World Health Organization. Global initiative for the elimination of avoidable blindness. Geneva: WHO; 1997. p. 1-7. 2. Resnikoff S, Pascolini D, Etyaale D, Kocur I, Pararajasegaram R, Pokharel GP, et al. Global data on visual impairment in the year 2002. Bull World Health Organ 2004;82:844-51. 3. Foster A. Cataract and "Vision 2020: The right to sight" initiative. Br J Ophthamol 2001;85:635-7. 4. Thylefors B, Negrel AD, Pararajasegaram R, Dadzie KY. Global data on blindness. Bull World Health Organ 1995;73:115-21. 5. Tabbara KF. Blindness in the eastern Mediterranean countries. Br J Ophthalmol 2001;85:771-5. 6. Lewallen S, Courtright P. Blindness in Africa: Present situation and future needs. Br J Ophthalmol 2001;85:897-903. 7. Keeffe JE, Konyama K, Taylor HR. Vision impairment in the Pacific region. Br J Ophthamol 2002;86:605-10. 8. Dolin PJ, Faal H, Johnson GJ, Ajewole J, Mohamed AA, Lee PS. Trachoma in the Gambia. Br J Ophthalmol 1998;82:930-3. 9. Wild S, Roglic G, Green A, Sicree R, King H. Global prevalence of diabetes: Estimates for the year 2000 and projections for 2030. Diabetes Care 2004;27:1047-53. 10. Wong TY, Loon SC, Saw SM. The epidemiology of age related eye diseases in Asia. Br J Ophthalmol 2006;90:506-11. 11. Ramke J, Palagyi A, Naduvilath T, du Toit R, Brian G. Prevalence and causes of blindness and low vision in Timor-Leste. Br J Ophthalmol 2007;91:1117-21. 12. Kocur I, Resnikoff S. Visual impairment and blindness in Europe and their prevention. Br J Ophthamol 2002;86:716-22. 13. Hubley J, Gilbert C. Eye health promotion and the prevention of blindness in developing countries: Critical issues. Br J Ophthalmol 2006;90:279-84. 14. Vaidyanathan K, Limburg H, Foster A, Pandey RM. Changing trends in barriers to cataract surgery in India. Bull World Organ 1999;77:104-9. 15. Rabiu MM. Cataract blindness and barriers to uptake of cataract surgery in a rural community of northern Nigeria. Br J Ophthalmol 2001;85:776-80. 16. Courtright P, Kanjaloti S, Lewallen S. Barriers to acceptance of cataract surgery among patients presenting to district hospital in rural Malawi. Trop Geogr Med 1995;47:15-8. 17. Jadoon Z, Shah SP, Bourne R, Dineen B, Khan MA, Gilbert CE, et al. Cataract prevalence, cataract surgical coverage and barriers to uptake of cataract surgical services in Pakistan: The Pakistan national blindness and visual impairment survey. Br J Ophthalmol 2007;91:1269-73. 18. Thomson I. A clinic based survey of blindness and eye disease in Cambodia. Br J Ophthalmol 1997;81:578-80. 19. Iraqi Ministry of Health, Department of preventive statistics. 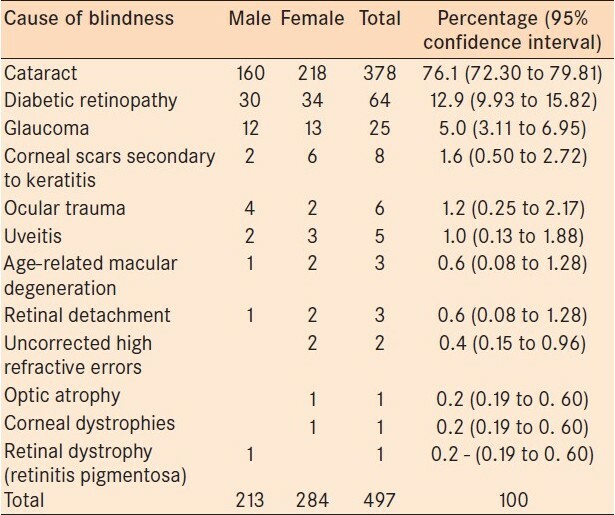 Unified application statistics of blindness and eye diseases for all hospitals in the governorates 2007. 20. Iraqi Ministry of Planning. Central Organization for Statistics and Information Technology. Available from: http://www.cosit.gov.iq. [cited in 2010]. 21. Iraqi Ministry of Health, Directorate of Public Health and Primary Health Care. Chronic non-communicable diseases: Risk factors survey in Iraq, 2006. 22. Al-Shakarchi FI. Initial therapy for suppurative microbial keratitis in Iraq. Br J Ophthamol 2007;91:1583-7. 23. McLaren DS. The epidemiology of vitamin A deficiency disorders. In: Johnson GJ, Minassian DC, Weale R, editors. The epidemiology of eye diseases. London: Chapman and Hall Medical; 1998.